I'm not known for having a lot of mercy. Needless to say, when I am in a room of people who are gifted with mercy, I annoy them. Sorry about that. That doesn't mean that I don't have compassion. I really, really do. But something happened to me the other day that really brought this to my attention. For the last week, we have been getting home earlier than usual. School hasn't started and the fall dance schedule hasn't kicked in yet. So I have had some time to work on the house. I decided to trim the hedges in the back yard the other day (there were about 6 months overdue) and I made quite a mess. So I asked Betty and Anneka to come and help me. While we were piling up the clippings for disposal I told my daughter that while living on the farm this was my life. Go to school, come home and work on the farm until the sun set. It was always a race against the sun to get the job done so there was no resting or "taking your time". To which my daughter replied. "Well, no wonder you don't have any mercy." HUH? I didn't see that coming. But after thinking about it a while, I understood where she was coming from. In a world that comes with deadlines every day, mercy isn't a luxury that you get to afford. Mercy takes time. 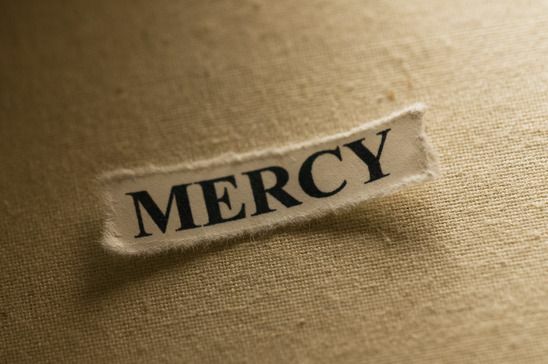 By definition, mercy is to not give someone what they deserve. While you may work hard and deserve a break, you don't get one until the job is done. Mercy takes patience. Being patient with someone while they learn how to follow Jesus can be tasking at times. But, in the end, it is well worth it. Mercy takes effort. True, mercy has never come naturally to me. But over time I have learned how to be merciful. I remember what Jesus said. How you treat others is how God will treat you. Hmm.